DARIO Spallone, the founder of upstart watch brand D1 Milano, has just “turned 26,” according to Martina Zonta, the company’s sales director for Asia Pacific, with whom Calibre spoke with during a visit to Manila. And yet the brand which started as a school project in 2014 — while Spallone was still attending Milan’s Bocconi University — now offers watches in around 500 sales points in Italy (of course), the Middle East (it was a Dubai competition through which capital for the company was raised) and several locations in Asia (where some of the biggest watch markets are). Definitely no small feat for a young company and CEO. This was in 2015. 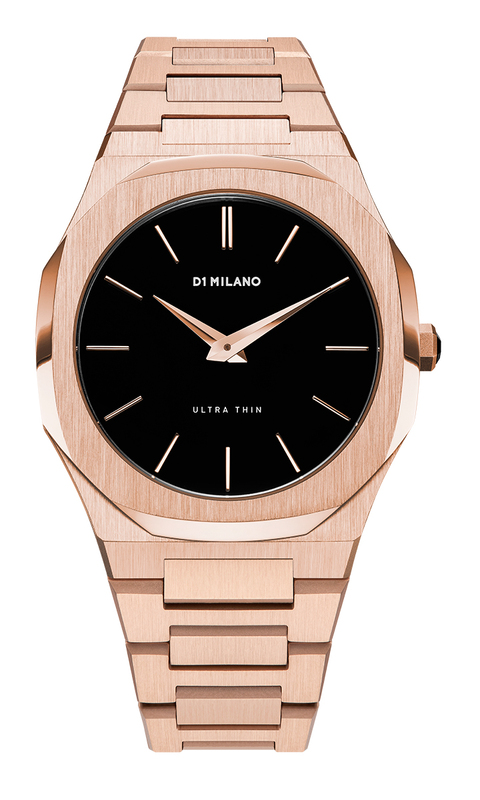 Since then D1 Milano has expanded its range and reach, and at present counts four collections each made up of numerous models. Following the Polycarbon, which remains the brand’s best-selling, are the Super Slim, Ultra Thin and P701. The pieces in three of the four collections — Polycarbon, Super Slim and Ultra Thin — are all quartz-fired while the P701 models are spun by automatic movements. All the movements are Japan-made; various components come from several places, including Europe; and the watches are put together in China. The entry-level pieces are the Polycarbons, which are housed in 40.5-millimeter cases combined with either Polycarbon bracelets or silicone straps, and which have fluorescent hands. There are over 40 combinations that comprise this collection. 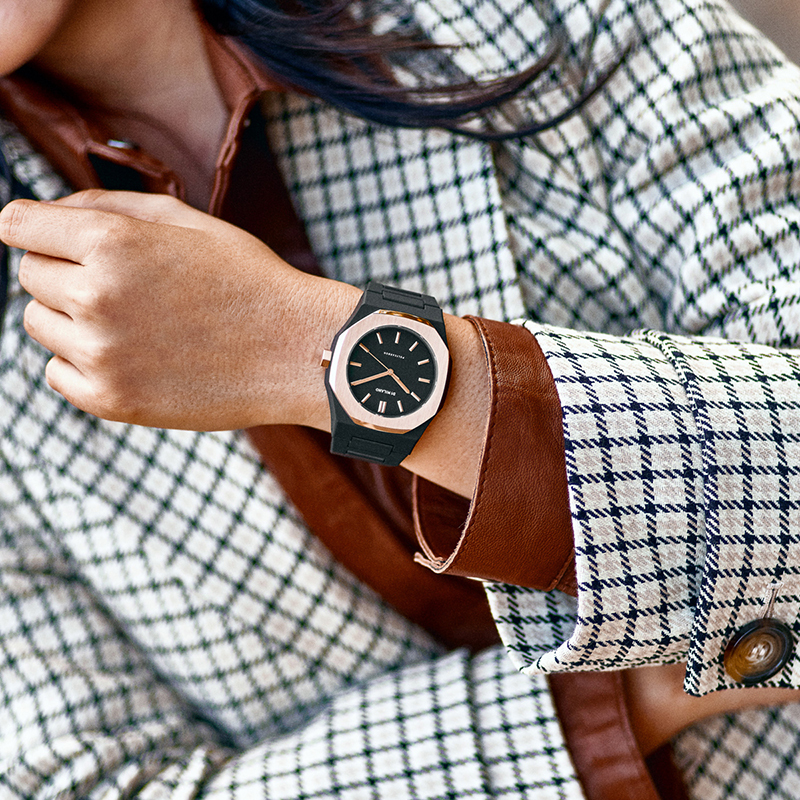 A step up are the Super Slim pieces, offered in both 36-millimter and 41-millimeter steel cases, and with interchangeable straps — Perlon, leather and Milanese bracelet. Topping the quartz collections are the Ultra Thin models. Coming in 40-millimeter and 38-millimeter cases, the watches belonging in this line look more mature, more luxurious than those from the other two quartz choices. The Ultra Thins are also available in a variety of strap options, including nylon, suede, leather and steel bracelets. 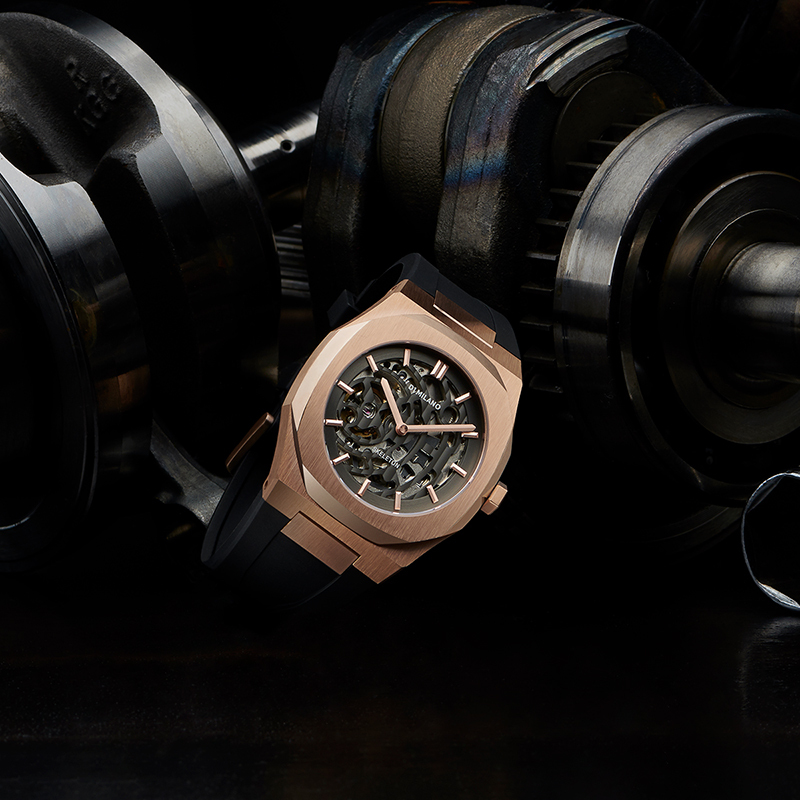 The dozen variations of the P701 watches, for their part, represent D1 Milano’s lunge at serious watch-making. While still identified by the brand’s signature aesthetics, they are the largest among the lot, wearing 41.5-millimeter cases, and with some of them striving for high-horology features, like a skeletonized dial. 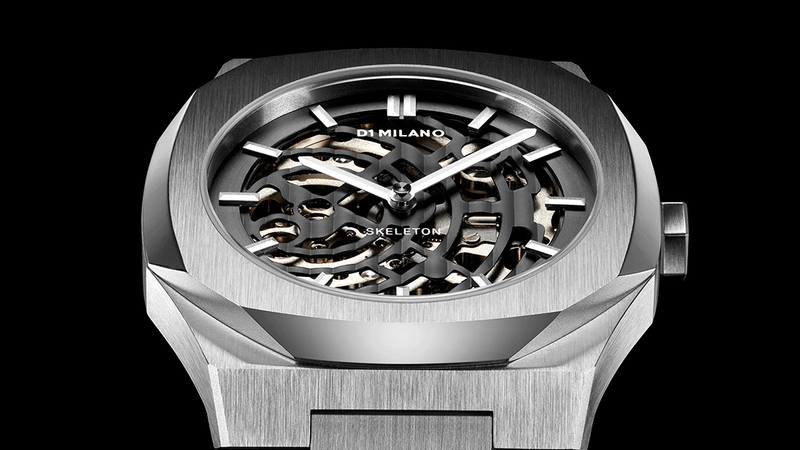 Just as impressive is that their automatic movements are housed within a case no thicker than 10 millimeters. For its sub $1,000 price segment, this touch is nothing to scoff at. 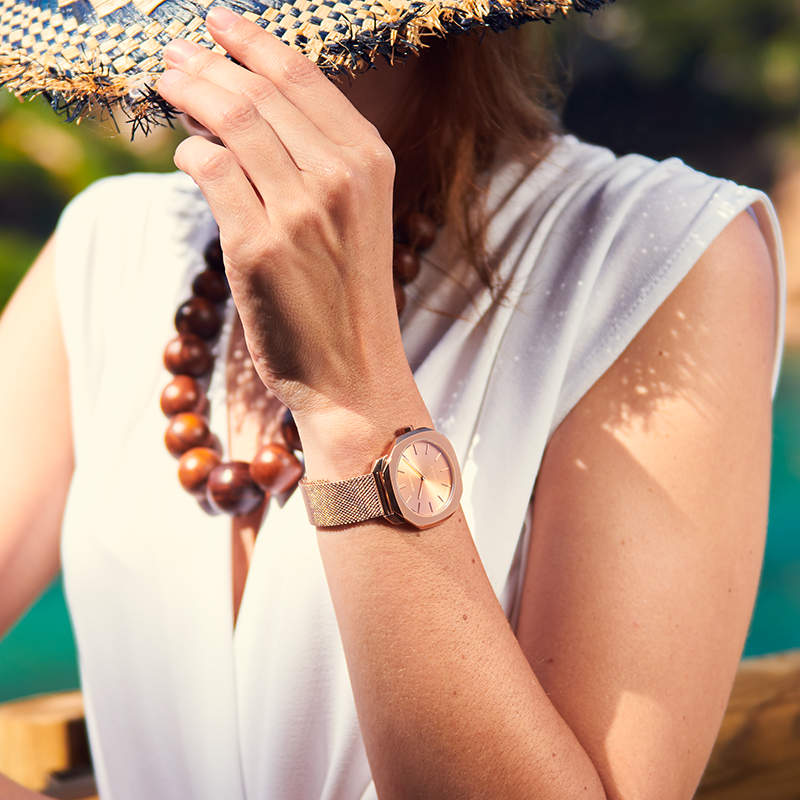 Zonta notes design is actually another of D1 Milano’s strengths, saying people are reminded of luxury when they see the brand’s watches. D1 Milano pitches its design as reminiscent of Italian fashion from the 1970s (which it says is popular again these days), and is defined by simple lines and a focus on details. “But it’s not just about design. It’s also about the materials. 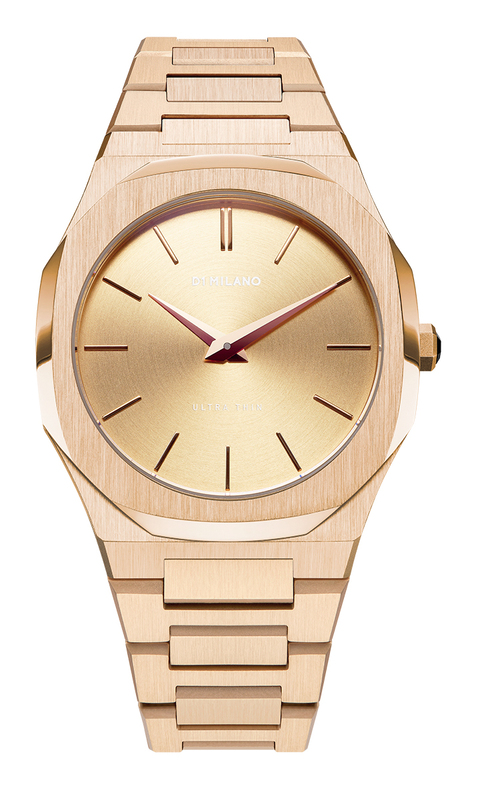 You can feel these are refined watches. The uniqueness of the brand is that we present to people a luxury watch — truly ‘aspirational’ — but which they can still afford,” Zonta says. “This is a watch that gives people social recognition even if it doesn’t cost $10,000. It’s not about the price,” says the CEO. Turns out this characteristic reflects Spallone’s personality, who Zonta describes as active and one who is not into fashion, but rather is stylish —preferring substance over fad, in other words. She shares the CEO does not want people to buy the company’s watches because they think of him as a brand, but would rather prefer people buy them because of what went into their creation. “We want consumers to feel that they are wearing something that came from actual people, from someone who comes from somewhere,” Zonta shares. In the Philippines, D1 Milano are now available in Swissgear stores in Greenbelt 1, SM North, Shangri-La Mall and SM North EDSA, as well as in Wristpod Uptown Mall, Robinsons Ermita and SM Megamall.